Disney’s main marketing strategy for their 50th animated classic release was to emulate DreamWorks. Stateside, the characters were shown with mischievous smirks and the trailers employed violent slapstick comedy and pop songs. The Princess and the Frog had been advertised as the triumphant return of the Disney fairy tale musical but didn’t quite earn the returns for which the studio had hoped. As such, seeing trailers and posters for Tangled gave the impression that it was something akin to Shrek or Chicken Little. I was pleasantly surprised to find that this couldn’t be further from the truth. Tangled tells an updated version of the Rapunzel story. The film opens up with a narration about a King and Queen and their baby who gets stolen. The baby is Rapunzel, and her kidnapper is Gothel, the woman she will come to know as Mother. Gothel traps Rapunzel in a tower for 18 years, convincing her it’s because she loves her and wants to keep her safe. On her 18th birthday, Rapunzel asks to be taken to see the “floating lights” – really a display of thousands of lanterns the King and Queen put on every year in hopes of the Princess returning. Gothel refuses to take Rapunzel outside even temporarily, but her luck changes when swashbuckling rogue Flynn Rider accidentally finds himself in her tower. I don’t have an organized top ten films list, but if I did, Tangled would be on it. The Rapunzel fairy tale was always my favorite, and as a kid, I wondered why Disney hadn’t adapted it, but I’m glad they waited because it wouldn’t have been like this. The technology Disney had available to animate things like clothing, plants and (duh) hair at this time was amazing. In hindsight, I give Princess and the Frog credit for reviving the Disney musical, but when Tangled came out, I really got the sense that the studio was back in business. Technically speaking, I consider Beauty and the Beast to be Disney’s greatest cinematic achievement, but I enjoy Tangled just as much. Sometimes a film, or any piece of art produced by corporations for mass consumption, can feel intensely personal. When I saw Tangled for the first time, I felt like it was meant for me in the way that Rapunzel feels that the lanterns are meant for her. That being said, Tangled has its flaws like any other movie. The opening narration and visuals are essentially perfect, and one of my favorite segments of the film, but directly after the prologue, the pacing of the next 35 minutes or so is off. It feels a little too quick, and at times it would be nice if the film would slow down a little bit, especially when Gothel and Rapunzel are talking about the lanterns. I don’t mean that there needs to be more dialogue in this sequence; just that what is already here seems to happen too quickly. The animation and editing seem frenetic until after Flynn and Rapunzel have teamed up. One common complaint against Tangled is that the music is too modern. I have to say that I find this ridiculous, especially coming from people who like Aladdin and Hercules just fine. Disney music has always been modern at the time that it was released. I think when people say this, they’re really saying that everything should be like it was when they were growing up. It’s an appeal to nostalgia, and it’s ridiculous. However, I do think it’s fair to say that Tangled doesn’t have as strong of a soundtrack as some of Disney’s other films. Nevertheless, that’s OK because the songs do serve their purpose, developing characters and moving the plot forward. Initially, I didn’t like “Mother Knows Best” because the first time it is performed, it’s very annoying and shrill. I’ve changed my mind completely, however, as the irritating sound is intentional, and contrasted very well by the show-stopping reprise later in the film. It’s a brilliant villain song; the first time we hear it, Gothel is emphasizing how much she loves Rapunzel and wants to protect her in an attempt to keep her in the tower. The second time Gothel feels herself losing control and turns threatening, playing on Rapunzel’s fears that Flynn isn’t sincere and doesn’t like her as much as she likes him. “I’ve Got a Dream” is a great song and scene: we get a lot of characters’ perspectives, and it’s so upbeat and happy. “I See the Light” is a great love song and duet; again, Rapunzel and Flynn reveal their feelings, and we also get to see how they’ve changed through the film to this crucial point. “The Healing Incantation” is lovely and brief. I just love that it’s in a minor key, as well as how haunting it is, and how “Bring back what once was mine” means different things throughout the film. I like the score better than the songs, with highlights being “Kingdom Dance,” “Back to Mother,” “Horse With No Rider” and “Campfire.” While this and Enchanted’s soundtracks are no Little Mermaid or Beauty and the Beast, they still represent a great comeback for the Alan Menken Disney musical. Rapunzel is voiced by Mandy Moore, someone I hadn’t really thought much about prior. She really brings the character to life, imbuing her with a sense of childlike wonder and naiveté that fits perfectly for a young woman who’s never seen the outside world. Rapunzel is an artist, cook and anything the confined space of the tower will allow her to be. She’s intelligent, kind and honest to a fault. She doesn’t know anything about family, the outside world or herself, save the warped paranoia Gothel has been teaching her. Similar to what I said about Tiana, I imagine that people might be disturbed by Rapunzel’s character development being facilitated by going on an adventure and falling in love with a man. I think this is a non-issue, and an attempt to politicize escapist entertainment. It works great in the film, and their burgeoning relationship is a highlight and one of the best romances Disney has done. Rapunzel’s character arc is also tied to Gothel, her sole role model and human companion through her formative years and adolescence. Rapunzel is good at heart, but she struggles with self-confidence and fears of the outside world instilled in her by “Mother.” The way she opens up around Eugene, in the Snuggly Duckling, and in the Kingdom is beautiful, and we see her sense of self changing and growing. The ultimate turning point for her comes when she realizes Gothel isn’t her family, that she is the Lost Princess and that everything she’s ever known is a lie. This is a great confrontation, where Rapunzel tells Gothel “No” for the first time and gains control of the situation. But this control doesn’t last for long, as Flynn comes for her and Gothel uses him as a bargaining chip. Zachary Levi voices Flynn Rider, who later tells Rapunzel that his real name is Eugene Fitzherbert. Eugene is my favorite love interest in a Disney movie since the Beast. The opposite of Rapunzel, Eugene is cynical and opportunistic at first, but in Rapunzel, he finds something he cares about more than himself, and together they go on a journey of self-discovery. Eugene was originally supposed to have an English accent, but after hearing Levi read for the role, the filmmakers preferred his normal speaking voice; I very much like his singing voice, too. Rapunzel is one of my favorite Disney characters, but Eugene may be more complex, as he experiences greater character growth. He explains that he got into a life of crime after growing up a penniless orphan, and the audience can surmise that he’s been very lonely, fending for himself for so long. His wisecracks and reluctance to sing (reminiscent of Enchanted’s Robert) hide a lonely soul simultaneously reaching for human connection while being too afraid to trust anyone fully. However, once he starts getting close to Rapunzel, things begin to change. His body language says a lot on its own: Gothel always reaches for Rapunzel’s hair, brushing it into her face, but Eugene pushes her hair away to see her better. Tangled has some of the best animal sidekicks in any Disney movie. I usually consider the sidekicks the weakest link, but Rapunzel’s chameleon Pascal and Maximus the horse are absolutely hilarious. They don’t say a word (thank god), but their body language is exaggerated and quirky. Pascal’s protectiveness of Rapunzel is adorable, and I love the way he progressively trusts Flynn more, sitting on his shoulder later in the film. Maximus’ rivalry with Flynn provides some good laughs, and it’s satisfying when he teams up with him to save Rapunzel. I also love the human supporting cat in the form of the bar thugs, voiced by the likes of Jeffrey Tambor, Brad Garrett and Richard “Jaws” Kiel. We also have some lower-level villains in the Stabbington Brothers, the speaking one being voiced by Ron Perlman. Mother Gothel is voiced by Donna Murphy, whom you may know from Spider-Man 2 and Star Trek: Insurrection. Again, not an actress I ever put much thought into before, but the lady kills it in this role. Gothel manipulates and emotionally abuses Rapunzel, always emphasizing how she’s not smart or strong enough to protect herself out in the world. She has a powerhouse voice and just the right amount of sweetness and ominousness. 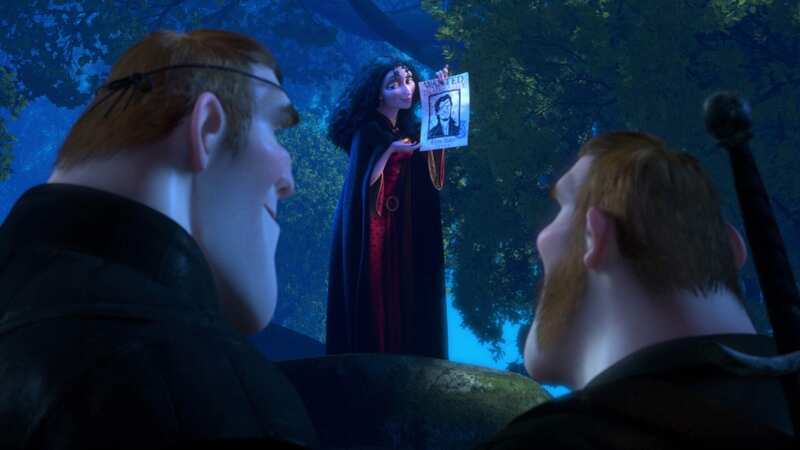 Gothel is my second favorite Disney villain after Frollo, with whom she has a lot in common: both raise children that are not their own and keep them locked away from the real world, use fear and intimidation to control those children, and are deeply mistrustful of other people. It’s been debated whether Gothel loves Rapunzel or not, but I really think she does, and that’s the scary part. It’s easy to say she’s just an evil lady who stole a baby with magic powers to stay young; that’s true, but it’s more complicated than that. 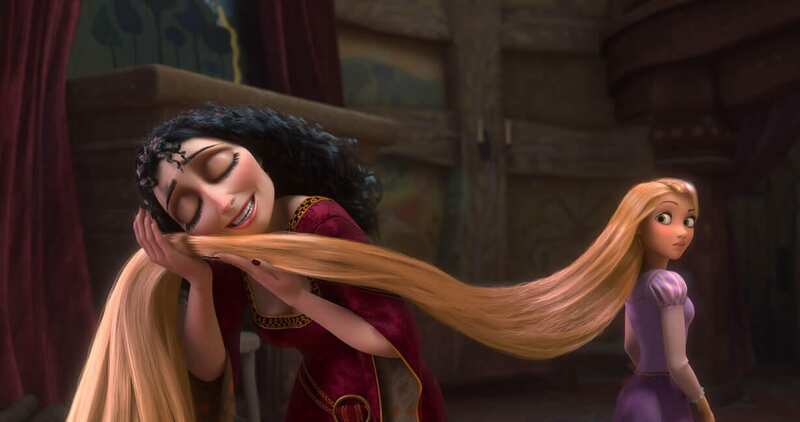 Gothel does things for Rapunzel (like getting the materials for her paints), she’s always hugging and kissing her, and there is sincerity in her voice when she says that she loves her. It’s not that she doesn’t care for the child she’s raised for 18 years; she just cares for herself and her own needs more. So many times throughout the film Gothel has the opportunity to do what’s best for Rapunzel, but she’s more interested in her own self-preservation. At first, it seems to Rapunzel that Gothel knows what’s best for her and Eugene wants to use her, but it ends up being exactly the opposite; Gothel is willing to kill the person Rapunzel loves most to keep her and her powers to herself, whereas Eugene is willing to die to give Rapunzel a chance at a real life. I also love the visual cues they surround Gothel with: her lantern in the prologue is a sickly green, while all of the other lanterns in the film are warm oranges and yellows. They also frequently manipulate the light source to bathe her face in light from below, or enshroud her in shadow, particularly later in the film. The animators and effects artists obviously have a great understanding of how to use things like color and lighting to communicate ideas to the audience, and it works beautifully. In fact, the atmosphere in this film is excellent in general. The prologue instantly feels magical, and even though they didn’t end up going with the classic Disney storybook opening, I get that feel from this sequence; It feels timeless. The atmosphere of Rapunzel’s tower changes depending on her mood, from bright and joyful in the beginning to somber and dark when she comes back near the end. The Kingdom is colorful, full of children and lively villagers. The tour of the Kingdom is one of my favorite parts of the film, and so much happens in such a short span of time: we’ve got the lovely aforementioned score piece “Kingdom Dance,” Rapunzel and Eugene getting to know each other, meeting new people, reading, and dancing. Tangled has a theme of dreams, both generally and specifically, with Rapunzel’s desire to see the floating lights and find out what they are. This feels very classic Disney, while also doing its own thing with the concept. Once they’re in the Kingdom and the lights are about to rise, Rapunzel expresses fear that she’ll be disappointed by the real thing after imagining it for so long, or that after getting her wish, she won’t know what to do. Eugene responds that it will be everything she’d hoped for, and afterward she can find a new dream. This is a great scene and one where we get a real feel for the connection she and Eugene have. 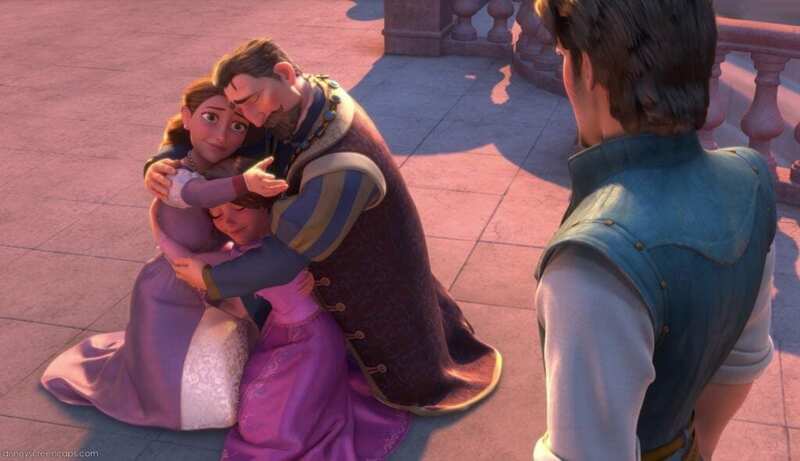 It also feeds into a short moment with Rapunzel’s parents that is nothing short of devastating. They don’t say a word, and it’s a very brief look into their 18 years of heartache, but it gets me every time. The animation on these two, particularly the King, is expert. If you don’t cry when he looks at his wife and breaks down, you’re probably an alien. I also love the scene at the very end when the family embraces, Eugene reaches to shake the Queen’s hand, and she pulls him into the hug. In bringing Rapunzel back to her real family, Eugene finds the family he never had. In addition to updating the Disney formula and implementing its own elements, Tangled also makes some adjustments to the Rapunzel fairytale. No longer peasants, Rapunzel’s parents are royalty, and she is the heir to the Kingdom of Corona. She is also kidnapped by Gothel rather than traded to her by her parents. In this version, Rapunzel’s hair has healing properties from a magical flower once used by Gothel to remain young, then given to the pregnant, ill Queen to keep her alive; this is why Gothel takes the child. Her tears still heal Eugene, but he is wounded directly by Gothel, rather than blinded by thorns. All of these are huge improvements and make the story more fluent. Tangled is not only one of my favorite Disney movies; it’s one of my favorite movies ever. I love the tight narrative, the complicated and lovable characters, the stunning animation and the lovely music. I have problems with the pacing, and not every song is a show-stopper, but overall this is a very fun movie, and a very heartfelt one too. I was a teenager when I first saw Tangled, and it took me back to a feeling of magic and wonder, and that feeling has stayed with me for years. It’s a deeply personal experience for me, and while results will vary from person to person, I would definitely recommend it. Tangled is not only one of my favorite Disney movies; it’s one of my favorite movies ever. I love the tight narrative, the complicated and lovable characters, the stunning animation and the lovely music. I have problems with the pacing, and not every song is a show-stopper, but overall this is a very fun movie, and a very heartfelt one too.